Danica Patrick finishes eighth, the best finish by a woman in the history of the race. 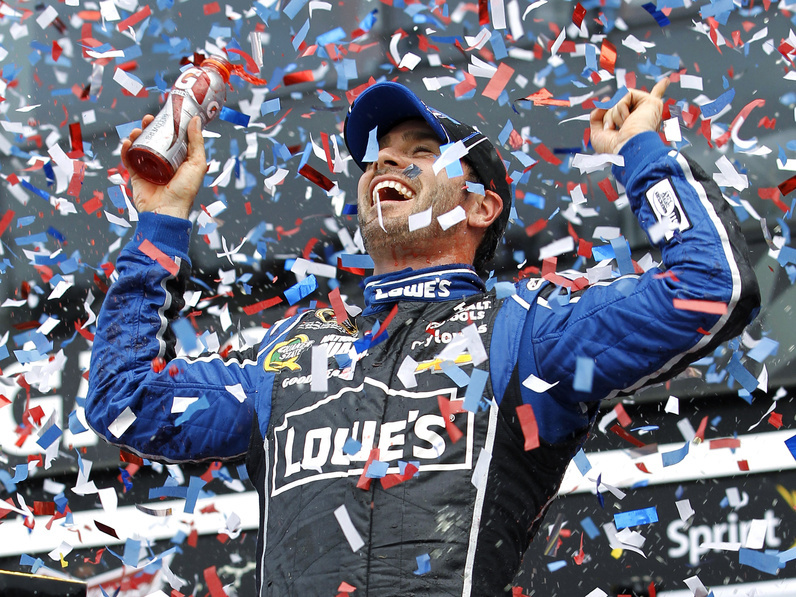 DAYTONA BEACH, Fla. — It was a big first for Danica Patrick, but an even bigger second for Jimmie Johnson. Patrick made history out front at the Daytona 500, only to see five-time NASCAR champion Jimmie Johnson reclaim his spot at the top in the end. Juan Pablo Montoya, 42, and Kevin Harvick, 29, collide while going into Turn 1 during the Daytona 500 Sunday at Daytona International Speedway in Daytona Beach, Fla.
Johnson won his second Daytona 500 with a late push on Sunday, grabbing the spotlight from Patrick as she faded on the final lap. Patrick became the first woman in history to lead laps in “The Great American Race” and was running third on the last lap, but slipped to eighth in the late push for position. Her fall began when Dale Earnhardt Jr. made his move, but his last-ditch effort wasn’t enough to catch his Hendrick Motorsports teammate. There were several crashes during the day, none approaching the magnitude of the wreck that injured more than two dozen fans a day earlier in a second-tier race on the same track. Johnson, who raced past defending NASCAR champion Brad Keselowski on the final restart, had pulled out to a sizable lead and nobody could catch him. He wasn’t challenged over the final six laps and cruised and added another 500 title to go with his 2006 victory. 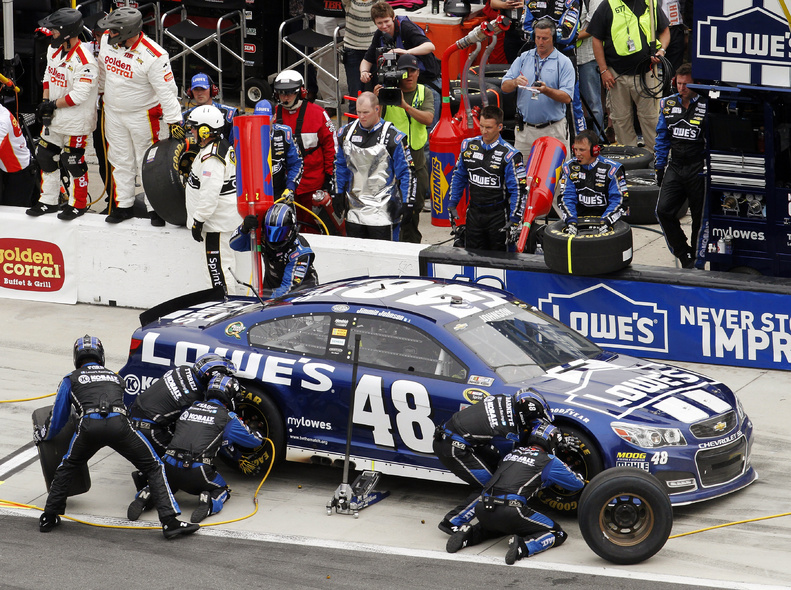 This time crew chief Chad Knaus can enjoy it — he was suspended by NASCAR for the first victory. Earnhardt Jr. settled for second as Hendrick drivers went 1-2 in the new Chevrolet SS. Mark Martin was third in a Michael Waltrip Racing Toyota. Keselowski, who overcame two accidents earlier in the race, wound up fourth in the new Ford that Penske Racing is fielding this year. Patrick, the first woman to start from the pole at NASCAR’s top level, was clearly disappointed with her finish. But she admitted she wasn’t sure what move to make if she was going to try for the win. Patrick became the first woman in history to lead laps in the 500 when she passed Michael Waltrip on a restart on Lap 90. She stayed on the point for two laps, then was shuffled back to third. Still, it was another groundbreaking moment for Patrick, who in 2005 as a rookie became the first woman to lead laps in the Indianapolis 500. Janet Guthrie was the first woman to lead laps at NASCAR’s top Cup Series, in 1977 at Ontario, where she led five laps under caution. Harvick had won two support races coming into the 500 to cement himself as the driver to beat, but the accident sent him home with a 42nd-place finish. “If I didn’t tell you I was heartbroken and disappointed, I’d be lying to you,” Stewart said. 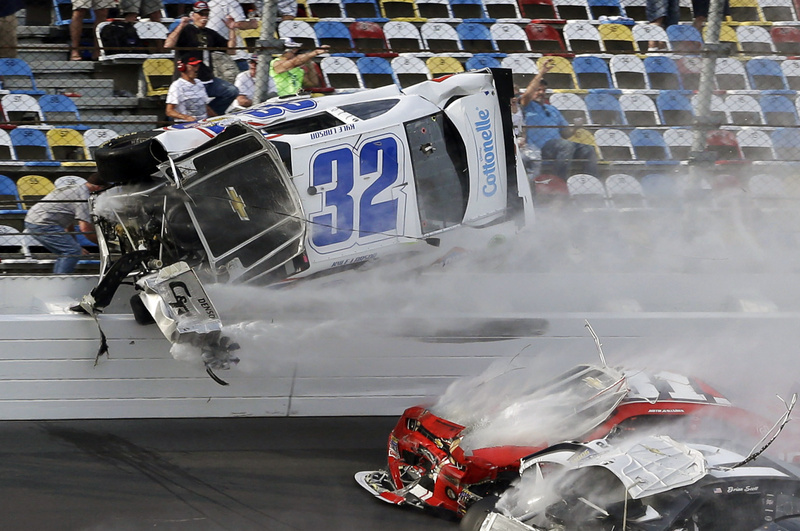 That accident also took Daytona 500 winner Jamie McMurray, his Chip Ganassi Racing teammate Juan Pablo Montoya, and Kasey Kahne out of contention. The field suddenly had six Toyota drivers at the front as Joe Gibbs Racing and Michael Waltrip Racing drivers took control of the race. But JGR’s day blew up — literally — when the team was running 1-2-3 with Matt Kenseth, Denny Hamlin and Kyle Busch setting the pace. Kenseth went to pit road first with a transmission issue, and Busch was right behind him with a blown engine. Busch was already in street clothes watching as Hamlin led the field. 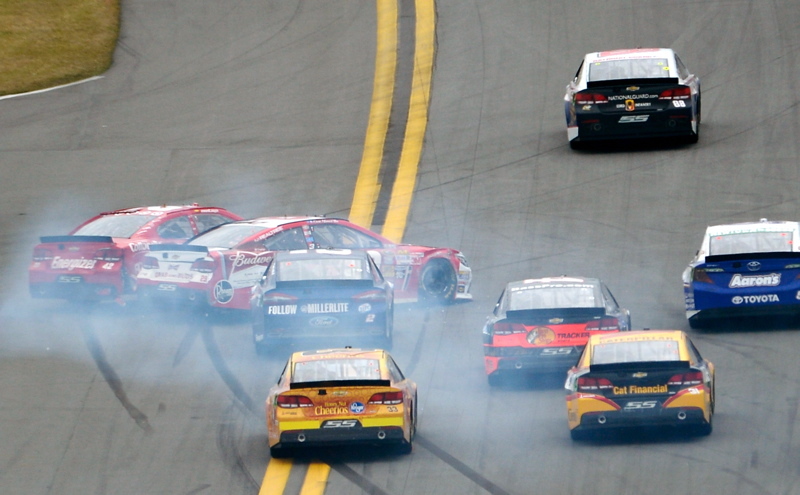 “It’s a little devastating when you are running 1-2-3 like that,” Busch said.